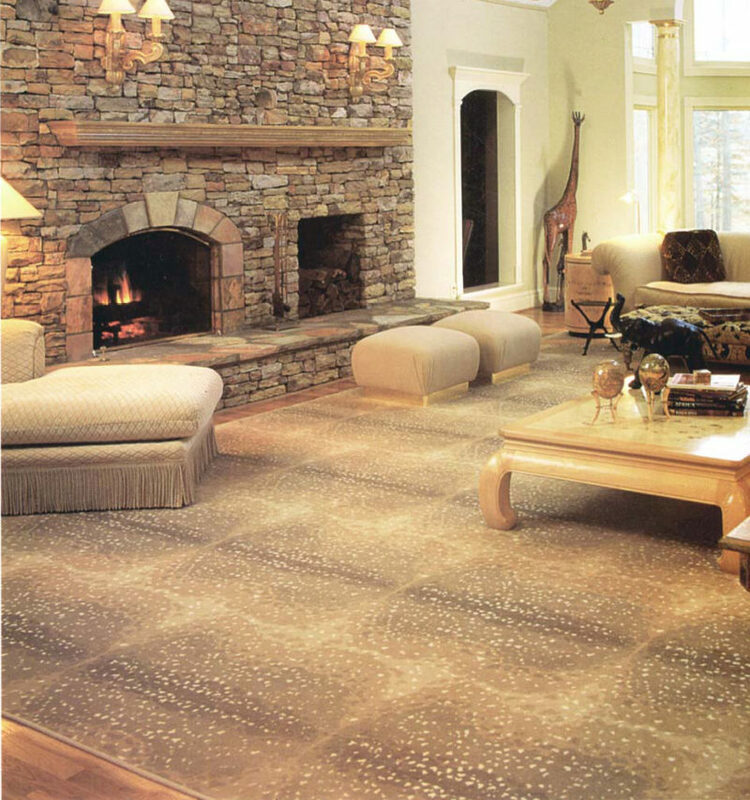 Custom sized rugs may also be made of our carpets featuring wool yarn surging matched to the carpet color. Some of our carpets have matching borders available. GLEN EDEN WOOL CARPETS IN STOCK in America in their mill in Chattanooga, TN. GLEN EDEN OUT OF AFRICA is our 100% New Zealand wool skins collection. These carpets are ever popular featuring a 36” by 36” repeat total skin look. 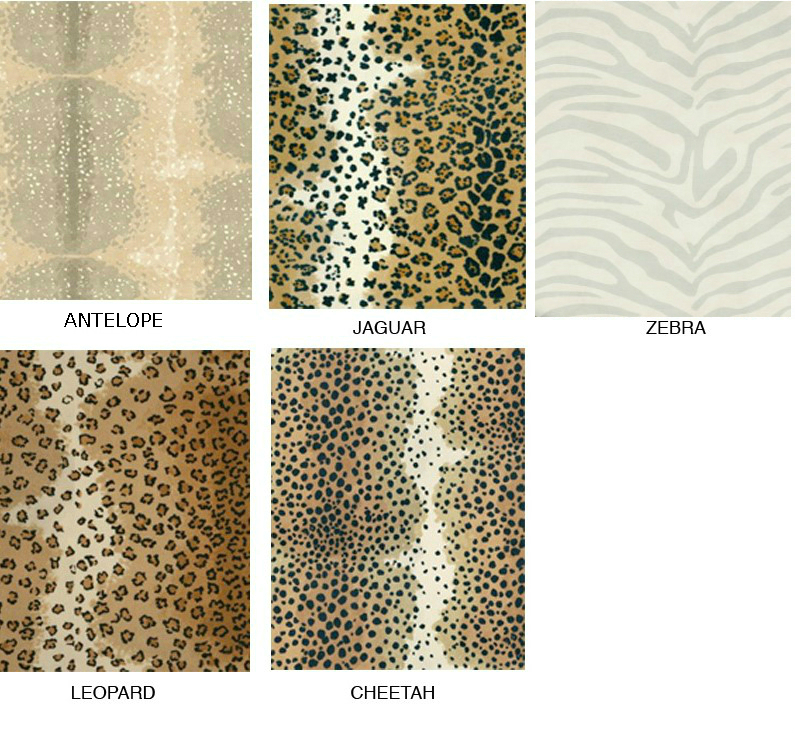 Out of Africa samples are recommended, as the texture has changed from previous samples. 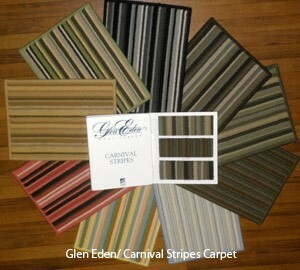 Glen Eden wool carpet samples are available in 13.5″ by 18″, 27″ by 18″ sets per pattern, or in folders in limited supply. Contact us for pricing for each product, which is based upon number of colors per design. POM Set: A full set of 136 poms is available for $85.00. DESIGNER BINDINGS: Cotton, Leather, Linen, Burlap, Crestino, & Wool Accents Strap Sets: $35.00 for the collection. VISIONS, CUSTOM CYP CARPET & RUGS are created by the Custom Yarn Placement machine, which tufts to your design specifications. You may select up to 6 colors in tip shear, loop, or cut pile combination, which give the look of as many as 12 colors. 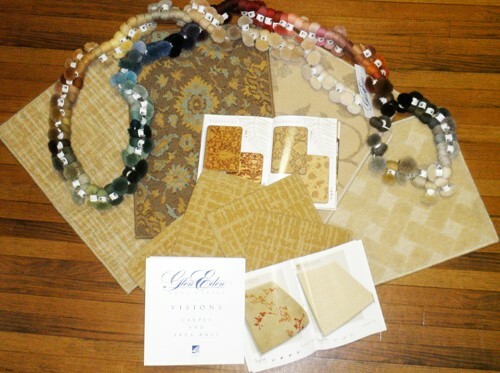 VISIONS CYP CARPET COLLECTION, & CUSTOM AREA RUG COLLECTION are rug design collections from which to choose your rug or broadloom carpet design. THE COLORS: May be selected from our 136 Fashion Color Poms. The yarn is 100% New Zealand wool. If you have a unique color which in not in our collection, we can match it to your color samples with an up charge. SIZE or SHAPE: We will make any size, shape, or shape to your template. 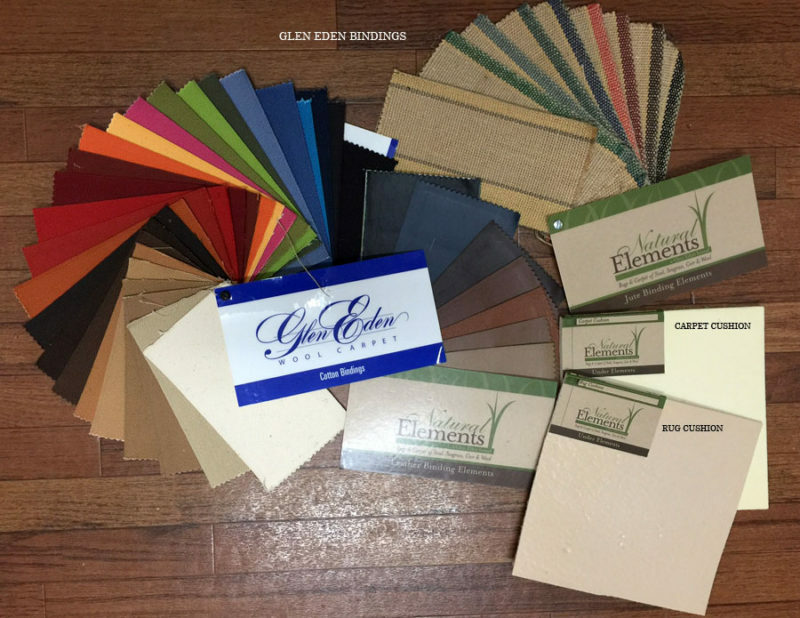 Glen Eden’s artists will provide you with a color rendering for a small charge for your designs using our pom colors. CUSTOM DESIGNS to your specifications are our specialty. 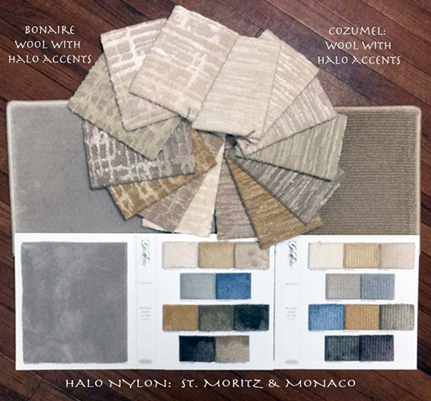 We recommend that you order an 18” by 18” Strike off sample for rugs, and 1 ft. by 1 ft. sample for custom carpets so that your client to see and approve prior to production of your custom rug. YARN WEIGHT: Custom rugs and Broadloom are available in a Residential weight: 55 oz., and a Heavy Residential weight of 65 oz. For Commercial weight, call for special pricing. CUSHION: RUG CUSHION may be cut to fit. One inch smaller than your rug. UNDER RESIDENTIAL CUSHION: (6 ft. width), & UNDER CONTRACT CUSHION: (6 ft. and 12 ft. width. Order to be shipped with your carpet or Rug. 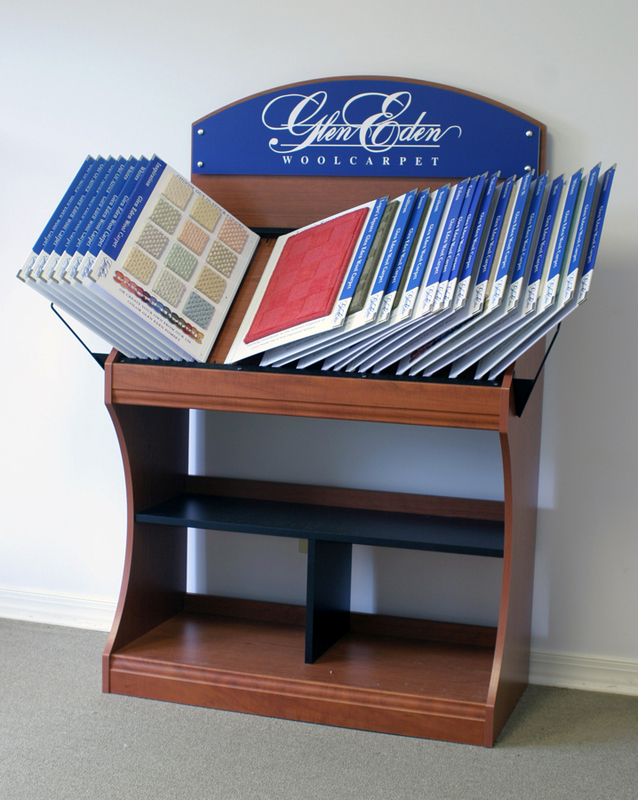 GLEN EDEN VERTICAL DISPLAYS AVAILABLE: The Wool Carpet Display has been updated for 2015. 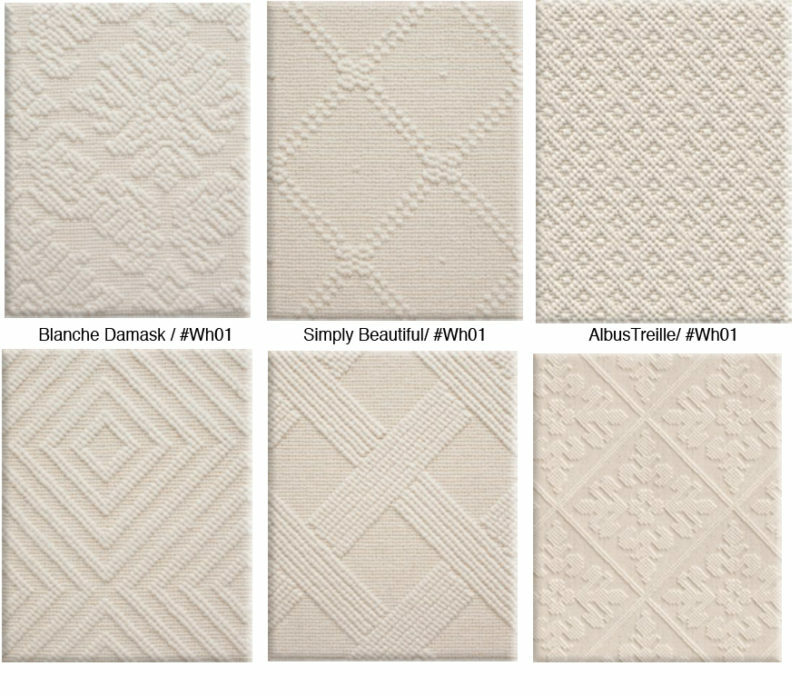 The NEW UPDATE consisting of 11 boards is available with the following products: Aria, Bonaire & Cozumel, Capri & Palma, Monaco & St. Moritz (Halo Nylon,) Outer Banks, and Out of Africa, and new Bella Vista White Collection Also available are the PREVIOUS BOARDS: Carnival Stripes, Inspiration, Mist, Simply Irresistible II, Taliesin, and White Collection. Call for pricing for our display, or new updates.